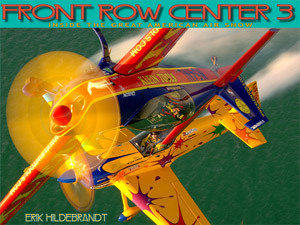 The FRONT ROW CENTER brand of airshow images and books have become the industry showcase standard for pilots and performers from every spectrum of the circuit. As quickly as the landscape evolves and changes, there seems to be a fresh edition of FRC to capture and present those new and often improved acts in photographs that preserve forever the feeling of pride and accomplishment that these players have for their performances. The pilots that I have flown with over the past 8 years have continuously caused me to grow and expand my own skills to keep pace with the innovations that they make in the skies. Finding new and dramatic ways to capture their unique approaches to aviation has become more and more difficult, but more than any previous edition of FRC, this volume represents the greatest leap forward in my abilities as an air-to-air photographer.